Wiesnkoenig (pronounced VEE-sehn-koh-neg) is the only officially licensed supplier of the original Lederhosen & Dirndls for the Munich Oktoberfest. We bring you this young hip and top quality fashion brand to the US! Wiesnkoenig fashion plays with all the traditional elements of bavarian apparel and transports these elements into everyday fashion, which is already worn by the young, dynamic and trendsetting people across the fashion capitals of Europe. 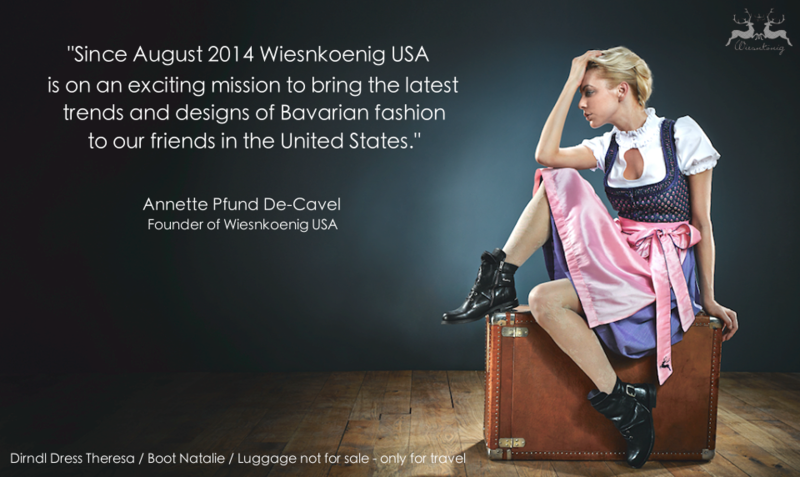 is our slogan and Wiesnkoenig is more than tradition & quality, Wiesnkoenig is a fashion statement not to be missed. Wiesnkoenig opened its first store outside of Europe on August 20th 2014, our US flagship store is located in Cincinnati´s hip over the rhine brewery district inside the Christian Moerlein Brewery, please feel free to visit us there to experience our full product line. The hight quality standards and the distinctive Wiesnkoenig design are the keys to our success. Starting with the careful selection of our materials, the creative minds of our designers and our quality control, we leave nothing to chance, and are always striving to make our customers fall in love with our products. Our trained and competent Wiesnkoenig USA team is looking forward to serving you via our online store or in person at our store in Cincinnati / Ohio, where you can dive into the world of Tracht & Fashion.